Pergolas are the beautiful structures that can add a lot of beauty to your outdoor spaces when created tactfully. So if you want to add some extra space and beauty in your outdoor space to enjoy even when the weather is not very appealing then here we are with some interesting Pergolas designs which you can adopt to make your space more useful and beautiful. Pergolas are the type of gazebo which can be used for many purposes like a small sitting place where you can enjoy peaceful winter mornings and beautiful summer evenings or to connect the outdoor space with your living space to make it more beautiful and useable; it is like an extension of the house. The main difference between pergolas and gazebo is that pergolas are often attached structures with open-lattice roofs while gazebos are free standing buildings with closed roofs and floors. A perfect pergola has a flat, open roof with very wide-open crisscrossing lattice or slotted beams which allow entering the dappled light from the sun. Sides of a pergola are made from two or four posts or narrow sections of any architectural material to allow plants and vines to climb up its open structure to cover the sides and roof. Pergolas are used as an outdoor walkway or to connect two buildings. Pergolas are also often used interchangeably with arbors as gateways to garden areas or as a covering for a swing or single bench. Usually pergolas are constructed from wood but you can also use metal, vinyl and fiberglass to construct pergolas. Before constructing the pergolas decide the location of the pergola first as you can construct them in the middle of your garden or even could be employed as a file format of the house. Pergolas are available in two styles Freestanding and Wall Mount. Free standing Pergolas has four post constructions whereas Wall Mount is attached with your existing structure so they have only two posts. You can get customized pergolas according to your specifications and space available. 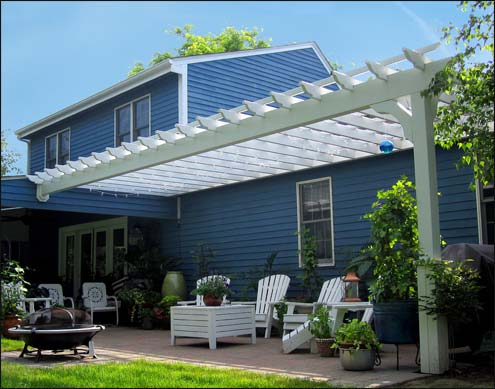 Pergolas enhance the design of the home's exteriors. There are many different styles and types of pergolas like Cladded pergolas, gabled pergolas, pitched pergolas and so on each of which has its own advantage and attraction, you can have any of them which complement your house and able to extend your living areas out into the garden in a comfortable way.